Ditch that fancy Mother's Day dinner and bring your mom for some fresh oysters at Jalan Kemuja, Bangsar. This coming Sunday, May 14, Jalan Kemuja will come alive with an Oystertastic STREET PARTY to mark the end of the 2017 Oyster Festival and also crown the next Malaysian Sporting Hero - Malaysia's First ever Oyster Opening Champion ! who will be representing Malaysia at the world's biggest oyster opening Championship this September in Ireland. Venue : Southern Rock Seafood Restaurant, Jalan Kemuja Bangsar. 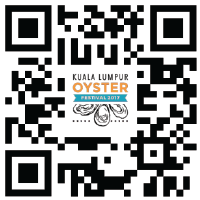 So come by Jalan Kemuja this Sunday to enjoy some fresh oysters while listening to live music performances by Lewis Pragasam Trio and Faliq Auri Trio - Malaysian Celtic Fusion Trio. There will also be entertainment for the kids. It's definitely a perfect place for a fun and oystertastic Mother's Day celebration.